There I was, rolling along with full-on momentum in the Big Beautiful World project, when suddenly I was mowed down by the gnarliest head and chest cold I’ve had in a long time. Ugh, it was the worst, and for a few days I could barely hold my head up enough to eat, never mind to write. At last. I am better (mostly) now. Just in time for Halloween! This photo is a little weird. I love it, but it’s weird. When we roadtrip to Massachusetts we tend to break the drive on the first day. Yes, we could get to Boston in a day (like we do on the drive home), but you know…why push it? We usually stop at the Publick House Historic Inn in Sturbridge. When we first went there, I quickly noticed two things. There is a Revolutionary War-era cemetery just off the grounds of the hotel. There was (note the past tense) a super old-school playground right next to the cemetery. The playground would have been old when I was a kid; the slide was one of the old metal ones that butts in shorts would stick to and burn on in the sun, the jungle gym was made of rusty metal pipes that had been had at by the falling trees. But still. The proximity to the cemetery was kind of mind-blowing. I call this one Juxtaposition. I think that’s self-explanatory. 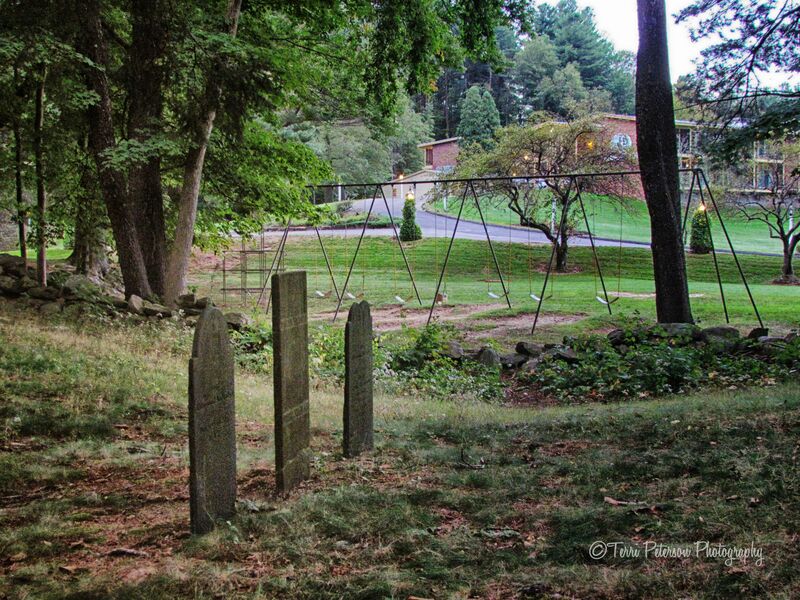 Unfortunately, on our most recent visit to Sturbridge we saw that the playground was no more. I know it was old and untrustworthy…most likely a vehicle for tetanus…and had to be taken down, but alas, I miss its odd existence. Thankfully it’s still a big beautiful world, and plenty weird even without the juxtaposition. Have a happy Halloween! Don’t eat too much candy. In one sitting.